Airliners-India :: View topic - Vistara launches Pune ahead of other stations – Why? Posted: Sun Mar 29, 2015 12:25 am Post subject: Vistara launches Pune ahead of other stations – Why? It was no surprise that Vistara, the joint venture of TATA & Singapore Airlines – latest entrant in the Indian Skies choose to fly to Pune this soon. Newspapers and online media was abuzz with the network plan based on the submission the yet unnamed airline made to DGCA and formed part of the public notice DGCA had on its website sometime in May 2014. Back then I had tweeted that the plan submitted and the plan followed is different in most of the cases and has been so in this case too. Vistara – the now named entity continues this with choosing Pune over Bengaluru, Srinagar, Patna and Chandigarh, which were listed to come online in the first year of operations as per submitted plan. Pune is the most populous city in the country which is not a state capital and was known more of retirement destination and education hub till the Information Technology boom. As things started changing in late 1990s, the city along with its neighbor Pimpri – Chinchwad which is home to large manufacturing houses like Bajaj, Firodias and Tata’s has seen exponential growth. Despite the booming economy, the city has to rely on Civil Enclave at Air Force Station Lohegaon for connectivity. The Air Force Station is one of the most important in the country and home to few active squadrons of frontline superiority fighter aircraft the SU-30MKI. 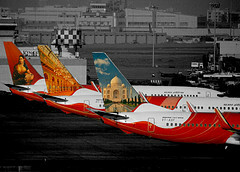 The aircraft was inducted in Pune in 1997 and since then continues to be based here. An active fighter base comes with limitations for civilian traffic and has led to restricted operating hours. The airport is closed from 0800-1030 and used to be closed from 2000-2230 until 2012. Pune saw an average 11% growth in traffic Y-o-Y and January 2015 saw 28% more passengers fly from Pune as compared to January 2014. The numbers could have been better had Spicejet not curtailed its services. Due to the limited slots offered to civilian movements by the Air Force – airlines are forced to adjust their flights as per slot availability and not commercial requirements. It is not just Pune which faces this but other Air Force controlled airports like Chandigarh, Srinagar and Bagdogra also face sot constraints and tend to be commercially successful for airlines like Pune. Pune, with its neighbor Pimpri – Chinchwad, has a population which is 20% lower than that of Ahmedabad but sees equal or more domestic traffic than Ahmedabad. However, taking into consideration the large catchment area – traffic has not picked up well for the city. Consider this, Pune has 25% less population than Hyderabad and 40% lesser than Bengaluru but the traffic is 46% lesser than Hyderabad and 65% lesser than Bengaluru! Will Pune be a smooth ride? Aviation is India can be much more than traffic and while Vistara has obtained an exemption for mandatory Route Dispersal Guidelines, that has come with a promise that the first three months when it is exempted would be fulfilled in the later months. Thus, Pune has its own importance since the city pair forms part of category 3 routes which no implications on route dispersal guidelines unlike a Delhi – Bengaluru flight. It is difficult to predict if the airline is making operational profits on metro routes due to lack of split between its passenger numbers, and the load factors are not something which the airline would be looking forward to. Vistara wanted to operate a morning / evening flight from Delhi to Pune and vice versa and the morning flight is not up and running due to the slot constraints at Pune! Vistara is likely to see fierce competition from Jet Airways which is upping the ante on lucrative Delhi – Pune sector by increasing the frequency to four from existing three. To aid this increase in frequency along with availability of bay for the Abu Dhabi shuttle, the airline will operate a late night Pune – Mumbai flight and an early morning return. Essentially the night parking it has in Pune will be utilized for the Delhi flight instead of the Bengaluru flight. Vistara will have its own challenges. A premium airline as it is branding itself will have to do with modest infrastructure in terms of office space, check-in counters and lounge at Pune Airport. The bigger challenge is competition with IndiGo being a dominant player on the sector with 5x daily flights. Vistara would connect Pune to a single destination Delhi. Compare that with incumbents like IndiGo who connect Pune to 11 destinations and Jet Airways and Spicejet to 8 each by direct or non stop flights. This is one challenge which the airline will face in all markets. IndiGo leads the frequency game with 5 frequencies on the sector along with the maximum seats on the sector, staggering 30% of all seats! Will Pune prove to be the premium market Vistara is on the lookout of? Only time will tell, but I feel Vistara is here to stay, adding one more frequency early morning or mid day in near term. Kingfisher during its peak found it hard to sustain a 20 seater business class cabin and had to shift back to all economy operations. Yes, the peak for Kingfisher was around the same time when economy was tumbling and a stable and growing economy could mean some good numbers in front cabin for Vistara. The airline would have to put forward its case and get more slots at Pune to not just increase presence on Delhi Pune sector but to also increase services to other important metro’s. With Vistara’s launch, all carriers except Air Costa would have presence in Pune!